Designed to work on multiple platforms, OpenCL will help you more effectively program for a heterogeneous future. 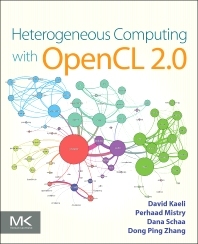 Written by leaders in the parallel computing and OpenCL communities, this book explores memory spaces, optimization techniques, extensions, debugging and profiling. Multiple case studies and examples illustrate high-performance algorithms, distributing work across heterogeneous systems, embedded domain-specific languages, and will give you hands-on OpenCL experience to address a range of fundamental parallel algorithms.